Several breed faults exist within the breed. These breed faults are listed in the breed standard as excluding flaws. However, these usually are minor beauty mistakes of the appearance. A Dalmatian with a small breed fault can’t go to a beauty exhibition with it. Because here, the dogs are examined by a judge, who checks whether the dog meets the breed standard. A Dalmatian dog with a breed fault will be disqualified by the judge. A dog however doesn’t experience any discomfort from this flaw. So it’s not a physical problem. In some other breeds, these “flaws” are allowed. The tricolour attribute is even desired for most hunting dogs. The breed clubs determine in their breeding regulations which faults exclude dogs from breeding. These dogs sometimes don’t get a pedigree. This differs for each country and club. A Dalmatian puppy is born completely white. But in some puppies, a big spot can already be seen at birth. This is usually located at the head and covers and ear and sometimes a part of the head. This is the so-called patch. Some puppies are born with a patch somewhere else on their body. If the spot is located around their eye, we call this a monocle. A patch is an external beauty mistake. These puppies are just as healthy and naughty as their brothers and sisters in the litter. Puppy buyers, but also children, usually love a doggy with a patch and think it looks funny, and these dogs are often the first dogs that are purchased from the litter. With our kennel, these dogs get an official pedigree. There are current discussions about whether it should be allowed to breed with these Dalmatian dogs within the breed clubs. This is allowed in the German breed club we’re a part of. In the Netherlands it is however not yet allowed to breed with these dogs within the breed club. The eyes of the puppies slowly open when they’re about 14 days. It starts with slits in the corners of the eyes, and then the eye slowly opens. This is always an exciting and very moving moment for the breeder. The puppies start to get a real expression and will start to react to their environment. Now, the breeder can also see whether the eyes of the puppies are all brown, which is what the standard prescribes. However, it does occur that there is a puppy with beautiful blue eyes, or one blue eye and one brown eye. Unfortunately, the standard doesn’t allow this, which makes this a so-called beauty mistake. The puppy can see perfectly normal and is just as lively as its brown-eyed litter mates. A Dalmatian puppy with a blue eye gets a pedigree with a so-called breeding ban. When the puppies are born, obviously you as a breeder, have to check to see whether they’re complete. Four legs and a beautiful straight little tail. On very rare occasions, there might be a puppy whose tail has a little kink in it, the kinked tail. This has no further consequences for the growing up or the health of this puppy. Sometimes, a breeder will have this kinked part of the tail removed, which eventually shortens the tail. 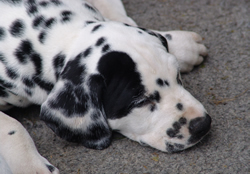 Dalmatian puppies with a kinked tail are not suitable for breeding and will receive a pedigree with a breeding ban. Kinked tails are genetic and we don’t want to further spread this in the breed. The experienced breeder will already see at birth how many liver/white spotted and how many black/white spotted puppies are born. The nose and the edges of the ear already show some pigmentation. In vary rare cases, a puppy is born that seems to be very white. As a breeder, you will wonder whether this puppy will ever develop spots. These puppies are usually much later with the development of pigmentation than the other puppies. These are usually lemon coloured puppies. A dilution of colour of the brown or the black. This is a colour that is a normally recognised colour variety with other hunting dogs. For Dalmatians it’s however undesirable. Eventually they will have a black coloured nose and yellow-like spots or a brown coloured nose with orange coloured spots. These dogs look very different and often look more like a hunting dog because of this particular colour. Because of this undesirable colour, also these puppies will receive a pedigree with a breeding ban. As in many other hunting dog breeds, multiple colours on one dog occur. Look for instance at the Beagle or the Basset hound. This is not allowed for Dalmatians. They need to be either black/white spotted or liver/white. If a black dog has brown like spots on it, we call this tricolour. This is a rare occurrence in the Dalmatian dog population. The dog will most often have rust brown spots on its belly, on its paws, on its jaws and under the neck. This phenomenon shouldn’t be mistaken for a so-called mutation spot. This can be a single dark-brown spot on a non-purebred black dog. The lighter spots on the bare belly of your dog are not alarming. These spots in the black spotted dog sometimes seem to be brownish, but aren’t. A tricolour puppy will receive a pedigree, however with a breeding ban.